GEORGE MCNEIL (1908-1995) had a career that spanned the entire postwar American art era. McNeil attended Pratt Institute and the Art Students’ League, where he studied with Jan Matulka. From 1932-36, he studied with Hans Hofmann, becoming Hofmann's studio classroom monitor. In 1936 he worked for the Works Progress Administration Federal Art Project and became one of the founding members of the American Abstract Artists group. McNeil was one of the few abstract artists whose work was selected for the New York World's Fair in 1939. During World War II, he served in the US Navy. In the late 1940s McNeil taught at the University of Wyoming and then taught art and art history at Pratt Institute until 1980, influencing generations of young artists. 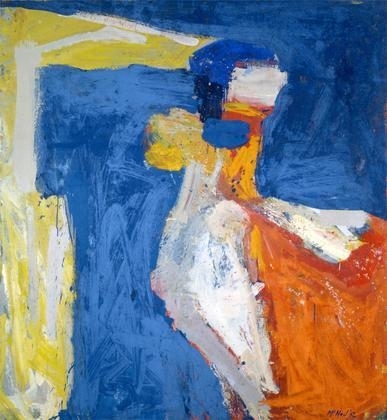 A pioneer Abstract Expressionist of the New York School, McNeil had over forty solo exhibitions during his lifetime. 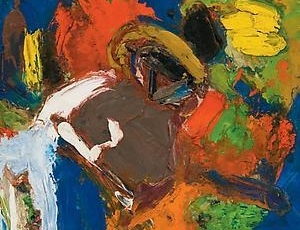 Between the ’40s and until the mid ’60s his art was decidedly abstract but it was always joined to metaphor. From the ’70s onward, McNeil explored ways to expand beyond the cannons of Abstract Expressionism. In this period his work became more figurative, drawing inspiration from the dynamic life of the city, its dancers, discos and sports. Throughout his career as a painter McNeil commanded a mastery technique, capable of creating paintings of rich texture depth and color. In 1989, McNeil was elected to the American Academy of Arts and Letters. His work is represented in numerous museum collections around the country, including The Museum of Modern Art, New York, NY; The Metropolitan Museum of Art, New York, NY; Whitney Museum of America Art, New York, NY; San Francisco Museum of Art, San Francisco, CA; Los Angeles Museum of Contemporary Art, Los Angeles, CA; and Walker Art Center, Minneapolis, MN. George McNeil died in January of 1995 in New York, NY. 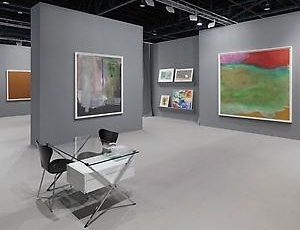 The contemporary New York art world has a backstory, rarely consulted, that begins in the optimistic 1920s and moves on to the bleak 1930s, a decade of Depression and institutional indifference to such local figures as Willem de Kooning, Jackson Pollock, and Mark Rothko. 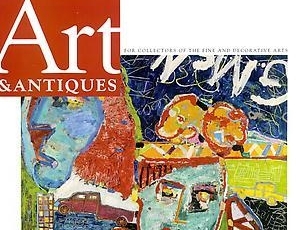 Then came the 1940s, with its succession of astonishing breakthroughs, followed by the ’50s, which trained the spotlights of critical recognition and market success on so many of the pioneers, who by that time had been gathered under the Abstract Expressionist label. As the ’60s began, even some of the second-generation practitioners of AbEx—Alfred Leslie, Joan Mitchell—were acquiring high profiles. But not George McNeil, even though he belonged to the first generation. NEW YORK An exhibition of work by the under-known New York School painter George McNeil (1908–1995) is always a cause for celebration. 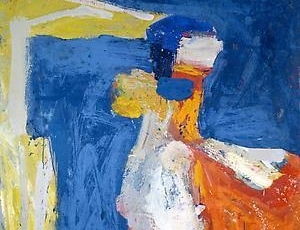 This one was of particular interest, centering as it did on a group of canvases made between 1960 and 1968, when McNeil began to introduce figural elements into his abstract compositions. 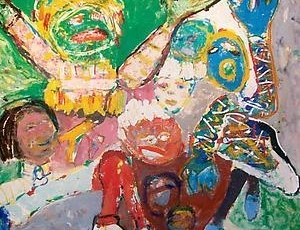 A contemporary of Jackson Pollock, McNeil was less famous than some of his Abstract Expressionist peers, and became even less so as the decades passed. He had a long and respectable career, nevertheless. In the 1930s, after studying with Jan Matulka and Hans Hofmann, McNeil cofounded the American Abstract Artists group. 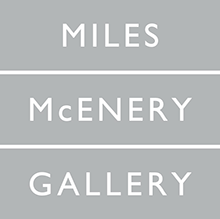 In the early 1950s, he was among Charles Egan Gallery’s original stable of artists, which also included Willem de Kooning—who was a fan—and Franz Kline. McNeil’s paintings from this time resemble satellite images, with fat, snaking lines like rivers or roadways enclosing heavily worked areas of color. By the 1960s, these topographies gave way first to discrete central forms and then to abstracted human figures. 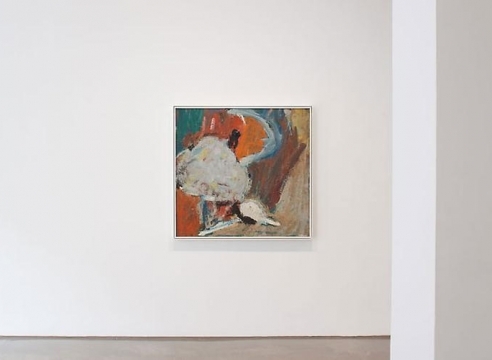 Art in America, "The Lookout: A Weekly Guide to Shows You Won't Want to Miss"
This is a chance to see a generous selection of McNeil's robust abstractions, mainly from the '60s. 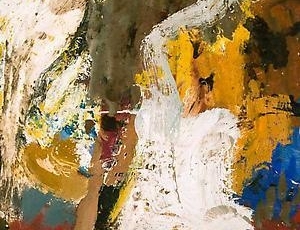 In each work, a surprisingly broad palette is applied in boldly brushed strokes and passages. The raucous figuration of the artist's later work is suggested-but here we understand the pure energy that would animate his later work. There were just five George McNeil paintings in Perlow’s tiny space this winter, but even this small number made me wishfor a full-on museum exhibition of this underknown artist.